Soak beans overnight in about 8 cups of water, or quick soak. * Drain. Heat a large pot or Dutch oven over medium heat, and sauté vegetable in olive oil to soften, about 5 minutes. Add beans and stock to the same pot. Add bay leaf, red pepper flakes, and ham. Bring to a simmer, stir and cover. Simmer 3 to 4 hours stirring occasionally and adding water if necessary. About an hour before serving remove ham and shred meat, removing bone and fat. At this point, it’s up to personal taste, but I like to either remove about a fourth of the beans and blend in a food processor or use a hand held blender to achieve a creamy texture – not a puree. Add ham back into the soup, remove bay leaf, taste for salt and pepper, and enjoy! Chopped green onions and hot sauce are popular condiments. Cornbread makes a nice addition. 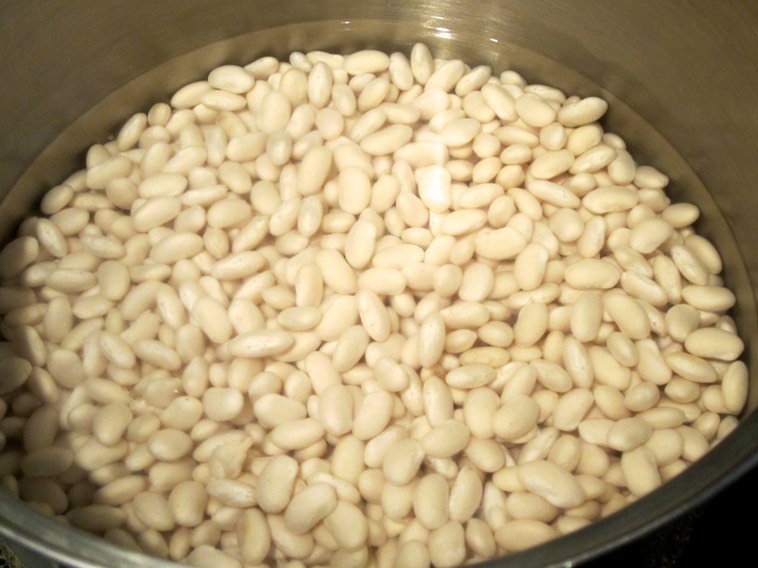 * Quick soak method: In a large pot bring 6 to 8 cups of water with beans to a boil. Boil two minutes, cover, remove from heat and allow to sit for an hour before proceeding with the recipe.